For most of the first half of the 20th Century, Ridgefield’s police protection was provided by state troopers, supplemented by a few town constables and deputy sheriffs. The constabulary, whose members dressed like policemen of the day, were led by the first selectman, who functioned as the police chief. In 1955, the town voted to create a “real” police department, with a real police chief, all overseen by an elected Police Commission. James Brady was chosen its first chief. James Joseph Brady Jr. was born in 1896 in nearby North Salem, N.Y. His parents moved to Ridgefield early in the century, and Brady grew up here, attending local schools. As a young man Brady — affectionately known as “Diamond Jim” — worked for automobile garages, both as a mechanic and as a livery driver. After the U.S. entered World War I, he joined the U.S. Army medical corps in August 1918 and was sent to France where he served under fire on the Alsace Front. 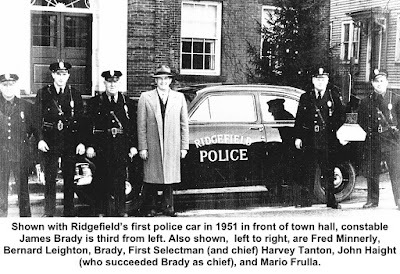 Back in Ridgefield, he continued working for garages, but in 1928 entered law enforcement, becoming a part-time town constable. In those days, only one constable was on duty during the day and one in the evening; Brady got the night shift. Three years later, he became a deputy county sheriff, serving until 1935. In his favorite case he helped state police stake out an often-burglarized Georgetown store and capture the thief. He and a trooper spent 22 nights in Connery’s Store until finally, on the 23rd night at 3:30 a.m., the fellow came in through a jimmied window to make his haul. The burglar turned out to be stealing goods to trade for bathtub liquor, and wound up leading police to two Branchville bootleggers. The bootleggers wound up in prison and were later both killed in a Long Island gang war. In the late 1930s, Brady served as an inspector for the motor vehicles department. During World War II, he worked as a fire inspector at the Remington Arms Company in Bridgeport where he rose to the rank of lieutenant. When the town voted in 1955 to establish a formal police department, he became the first chief and got the fledgling force on its feet. 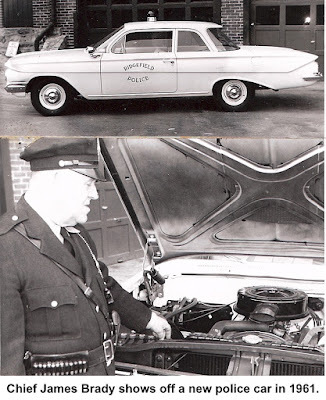 It was a small department with only one patrol car, and despite his being chief, his duties included directing traffic on Main Street. Park guard. He was also a longtime member of the Ridgefield Volunteer Fire Department. He died in 1976 at the age of 79. While Ridgefield was not a high-crime area in the 50s and early 60s, it did have a good bit of traffic. 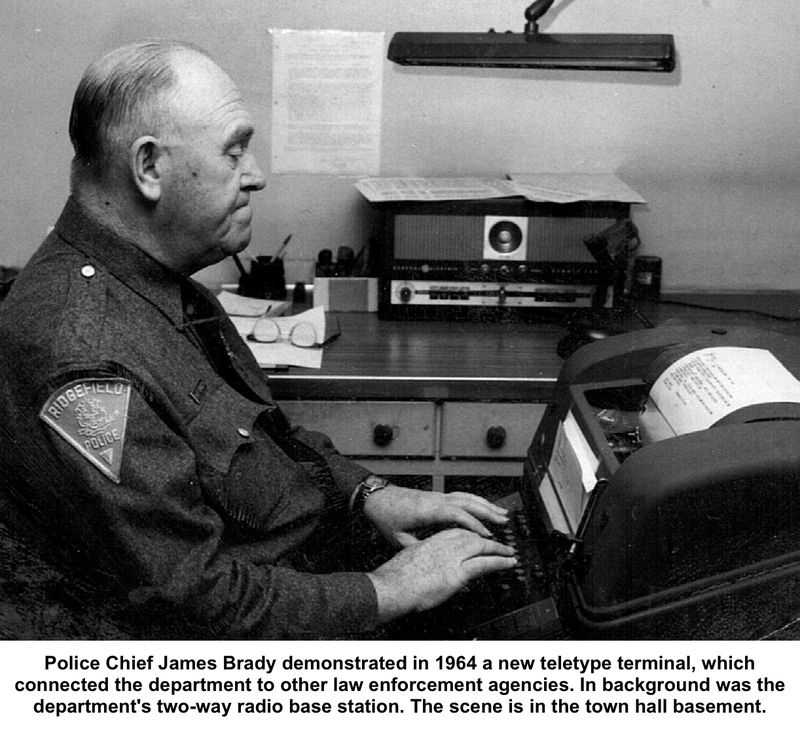 In that interview the year before he died, Brady said his biggest problem as a policeman were the motorists who failed to use directional signals. Thank you for this piece on my grandfather.